Mreže i stupovi za tenis	Pronađeno je 9 proizvoda. Made of 3.4 mm braided polyethylene, hand-knotted, black, double top five, stable polyester net enclosure stitched four times. 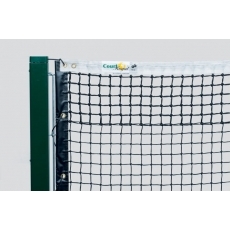 1000 times proven, classic tennis net. Used in the tennis league, ATP-tournaments, Davis-Cup, as well as in the Olympics. A topclass product. Complete with steel wire. 2 years factory warranty on the netting. DIN EN 1510. With European Seal of Approval. 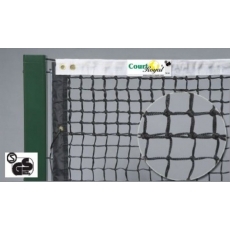 Made of 3.8 mm braided polyethylene, hand-knotted, black, double top 7, stable polyester net enclosure stitched 6 times, complete with plastic-coated steel cable. Sides and bottom with heavy, black plastic edging as well as two 10 mm strong fiberglass rods for lateral fixing. Long-lasting and very durable. 3 years factory warranty on the netting. DIN EN 1510.With European Seal of Approval. Made of 3.8 mm braided polyethylene, hand-knotted, black, double top six, stable polyester net enclosure stitched four times, complete with plastic-coated steel cable. Sides and bottom with heavy, black plastic edging, as well as 10 mm strong fiberglass rods for lateral fixing. Long-lasting and very durable. 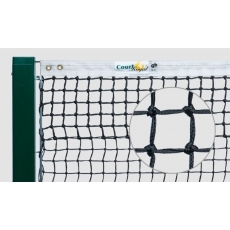 A tennis net in a special class. 3 years factory warranty on the netting. DIN EN 1510.